Shakira recently left Puerto Rico seeking refuge with her grandmother in Orlando. She’s pregnant and is now able to live in air conditioning and access medical care for herself and baby to be. Her husband is starting to find temporary construction jobs while she looks for work. Until they get on their feet, Shakira has been able to access food from Catholic Charities’ Mission Market. In addition to pantry staples, she enjoys visiting the welcoming market atmosphere and selecting from a variety of fresh fruit and produce, healthy food she needs for her developing baby. Victor and his family moved from Venezuela to Orlando a year ago in hopes of safety and security for their son and daughter. Their church community referred them to a local pantry where they can receive food assistance, including fresh meat, produce and bread. Victor said, “My children are most excited about the fruit, especially bananas and apples.” Because he and his wife work opposite shifts at local hotel to avoid the expense of child care, they rarely get to eat a meal as a family. They are most looking forward to celebrating together around the table this holiday season. Roberta says if she could eat anything, it would be salads and fruit. 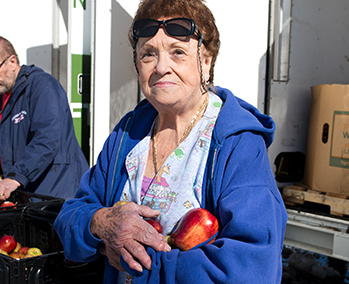 But her fixed income makes it difficult to afford fresh produce after paying for rent and medicine. Much of her remaining income has been spent on repairs to her mobile home or bottled water after Hurricane Irma. Through mobile food distributions and a local pantry, she has been able to restock her shelves and enjoy a fresh salad, for which she is thankful. Second Harvest Food Bank of Central Florida and its powerful network of over 550 feeding partners continue to experience a sustained heightened level of need to feed kids, families and seniors like Shakira, Victor and Roberta. You can help by hosting or supporting a virtual food drive, donating food or funds or volunteering with friends, family or co-workers. Together, we can provide hope for the holidays. Inspired to help more of our neighbors in need like Shakira, Victor, and Roberta? Find ways to help!